At their time trial last week, Rugby Racing Cycling Club took the opportunity to make an award to Laurie Bird for his outstanding contribution to the club over many years. The photograph shows Laurie receiving his award from club chairman, Martin Orrill. Laurie is officially the club treasurer but is also so much more than that. 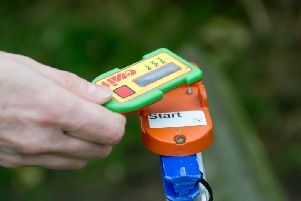 He is the club’s chief timekeeper, results calculator and website administrator and organises their very popular annual club open event which attracts entries from all over the UK and is often praised by riders for its seamless running. In addition to this Laurie is treasurer of Cycling Time Trials Midlands Division helping to promote and organise cycling events throughout the region. Laurie joined the club in the 1989/90 season to support his son’s participation in time trialling, joined the committee a couple of years later and has stayed ever since. He can still be spotted on occasion cycling the lanes of Warwickshire although he admits that of late his pace has slackened a bit! Rugby Racing Cycling Club held their last 10 mile time trial of the season on the Thurlaston course on Wednesday, their fastest course. Private entry Craig McKee was the winner in 20mins 33secs, just one second ahead of Ryan Kenworthy. Dave Elliot the best of the club’s first-claim members in 21-35. Conditions were good but with a strong crosswind. The event attracted a field of 42 riders, including seven private entries. Handicap winner was Eleanor Humphries in 18-17 and Ben Leugs in 18-53. This was the last time Rugby RCC were able to use the excellent facility of Rimo Growers so they have to find a suitable site if they want use this fastest course again next season.